Since we were staying in the Gaslamp district of Downtown San Diego, we decided to check out Little Italy, which was fairly close by. Who doesn’t like pasta?! 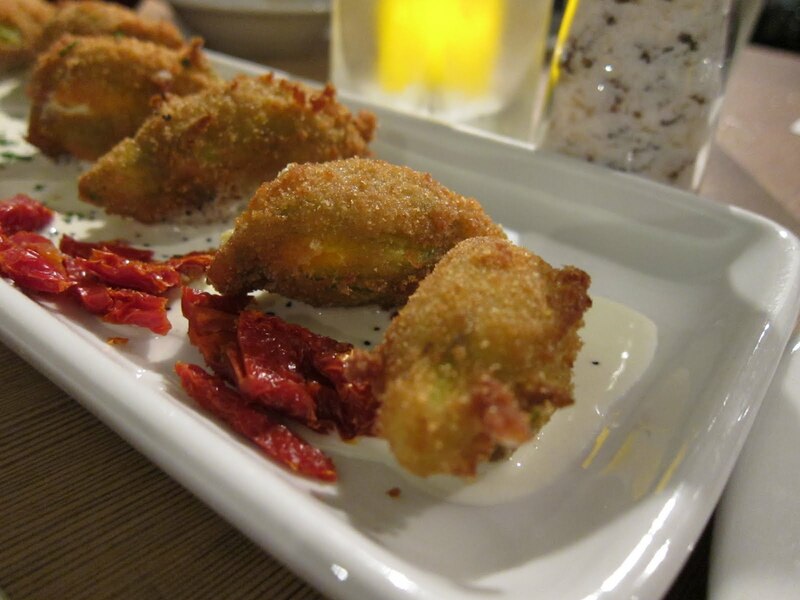 I’ve never actually tried zucchini blossoms before, but who knew a flower could be so tasty? I guess anything that’s fried and breaded will be delicious, but the creamy mixture of cheeses used to stuff this little guys made for a winning combination. The side servings of sun dried tomatoes added great contrast of flavor. The other members of the party didn’t seem too enthusiastic with this choice of appetizer (no chimes of agreement or “ooo that looks goood”), but since our first choice (fried saffron risotto balls) were out, I quickly threw this one in as the replacement. After everyone had their first tastes, the praises came raining down. 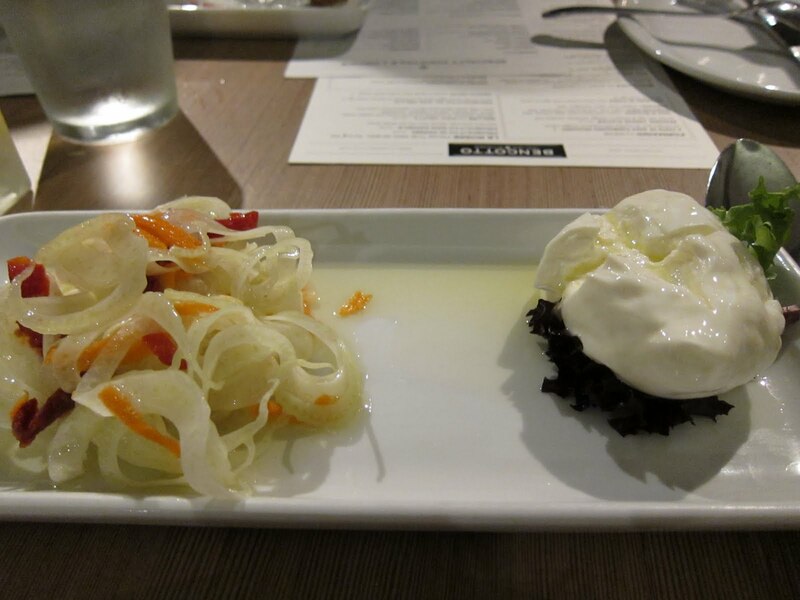 I suspect some did not know what burrata was or that fennel could be so crunchy and refreshing? 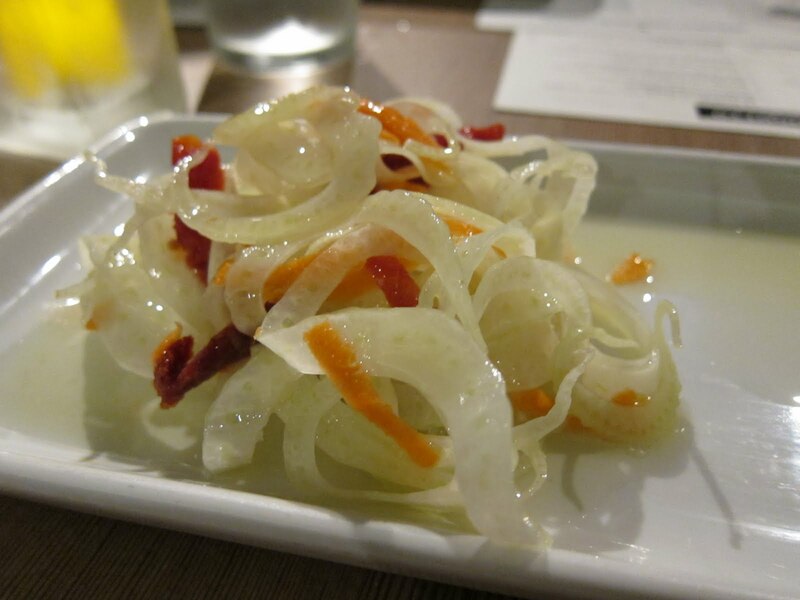 I love the simplicity of shaved fennel tossed with a simple vinaigrette. It was light and crunchy here and complimented the cheese well. 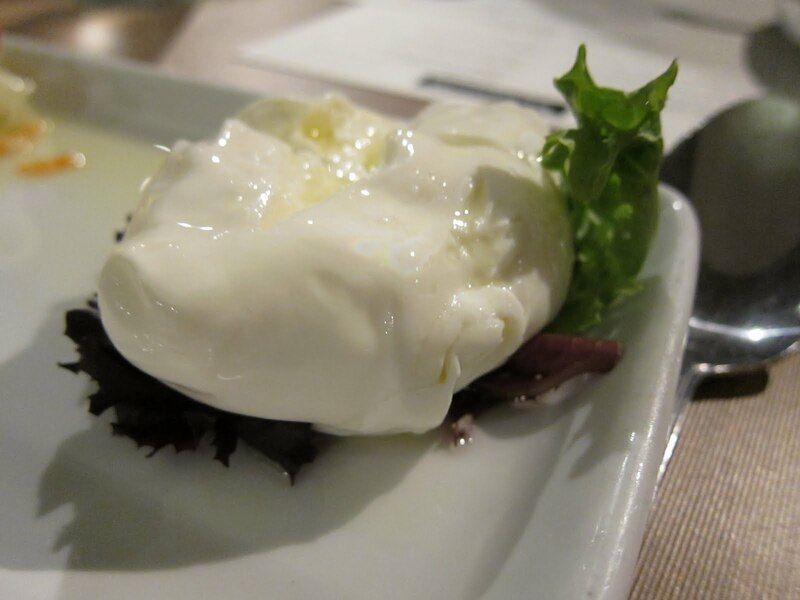 Certainly the burrata here was no match for that found at Osteria Mozza, but it was definitely smooth and creamy and very good. Unfortunately, this was the dish I ordered and only NOW do I realized what went wrong with the dish. I didn’t read the description closely until now, and that was when I realized the word “spelt” which means whole wheat. There was just something very dry and stiff about the pasta. I thought it was sauce which just didn’t have that tomato-y punch I expected. The lamb was a bit different and slightly gamey for a meat sauce. CMac Attack seemed as fairly unimpressed with the dish as well. Dubabo happily enjoyed her ravioli with added chicken. It was more plentiful than I was expecting. 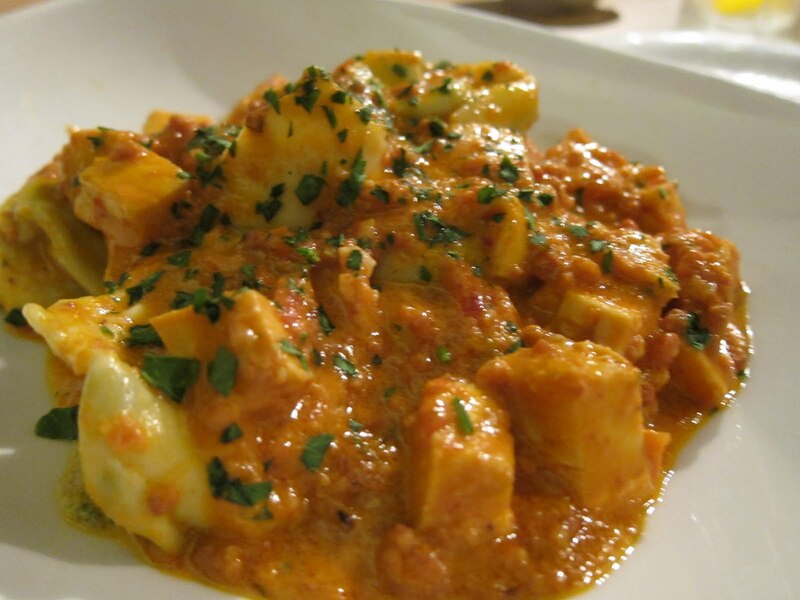 You know how the filled/stuff pastas can be a little chintzy on the portions. 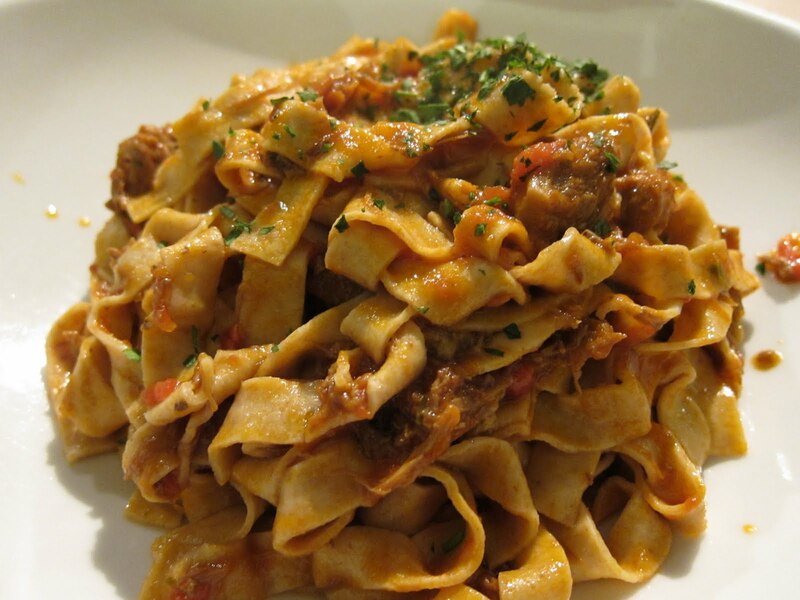 I am sad I went with the lamb dish instead of this one, since this was exactly what I was hoping for, handmade al dente pasta, tossed in tangy, spicy tomato sauce, with chunks of spicy sausage. DJ SuCha liked her choice, and I was jealous. 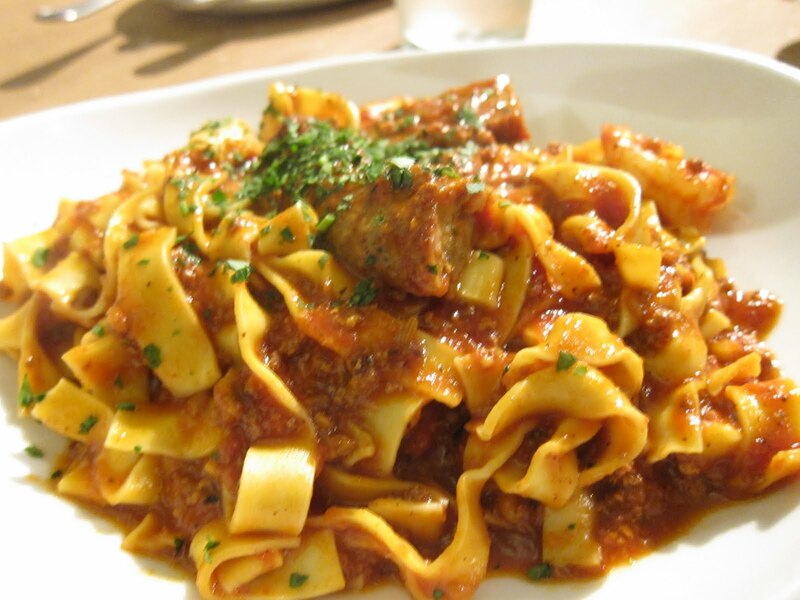 The pasta dishes are much larger than they appear on the pictures. We were all stuffed and I only ate half of my dish. We were trying to save room for dessert at Extraordinary Desserts which was just a few blocks away. I would recommend Bencotto for anyone looking for some good Italian food in the San Diego area. It didn’t really blow my socks off, but it was nice restaurant. Just don’t get anything with whole wheat pasta. I made the mistake of buying that at the market thinking I would be healthy one day. Ugh, it’s just a terrible product through and through, fresh or dried! The restaurant is pretty sleek and modern. The acoustics were pretty terrible in our dining area and the bathroom seemed like an after thought it in its construction so isn’t that nice, not to mention it had no AC that night so I felt like I was peeing and suffocating at the same time. Oh, our server was HELLA slow, but I am forgiving of bad service 90% of the time.